HTTP upload to xively.com (formerly pachube.com) via an Ethernet shield or Ethernet Arduino. Datalogging examples from tigoe gitHub repository, specifically the ones from the Citizen_Cyberscience_summit_2012 directory. Spreadsheet; OpenOffice is used here, but Excel will work as well. For more on the DHT sensors, see Adafruit’s tutorial. 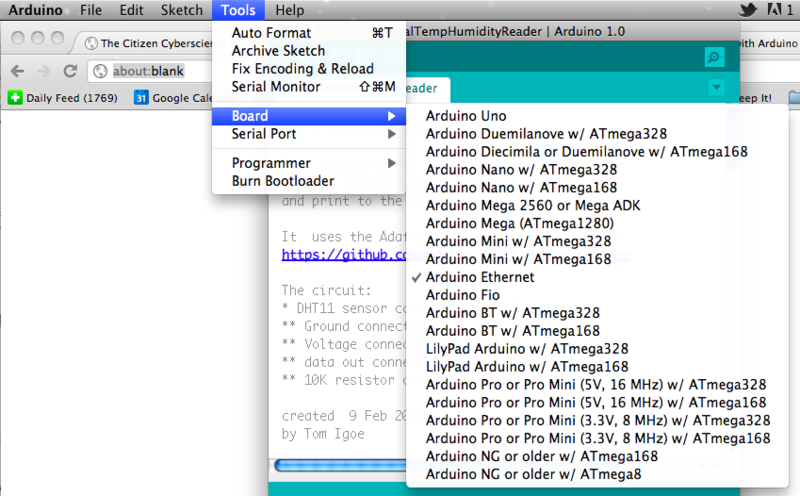 To get started, install the Arduino IDE and download the DHT library. Unzip the library and change the directory name to DHT, then copy it to the libraries/ directory of your Arduino sketch directory. If this is your first time using Arduino, the default location is in your user directory, called Arduino/ . You might have to create the libraries directory inside the sketch directory. Then download the example sketches from my gitHub repository, unzip them and save them to your sketch directory as well. Then start the Arduino IDE. Since the DHT11 sensor uses very little current, you can use the output pins of the microcontoller to power the sensor, using pins 5 and 8. Then attach the output pin of the sensor to pin 7. The output pin will also need a pullup resistor so that it goes high when no data is transmitted. To do this, connect the 10-kilohm resistor from pin 8 to pin 7, or to the +5V pin. The simplest way to get data off the sensor is to print the results out serially and capture them directly on your computer. To make this happen, you’ll need your Arduino attached via a USB-to-serial connection. The sketch SerialTempHumidityReader uses the Adafruit DHT library to read the sensor and sends the results back to the computer serially. Download it and copy it into a new window in the Arduino IDE. To find your serial port, check the Tools >Serial Port menu with the USB-to-serial adapter NOT connected. Then plug the adapter into your computer again and check the menu again. The new port that shows up is your USB-to-serial adapter’s port. When you’ve got the sketch loaded, open the serial monitor by clicking the Serial Monitor button on the right hand side of the toolbar. 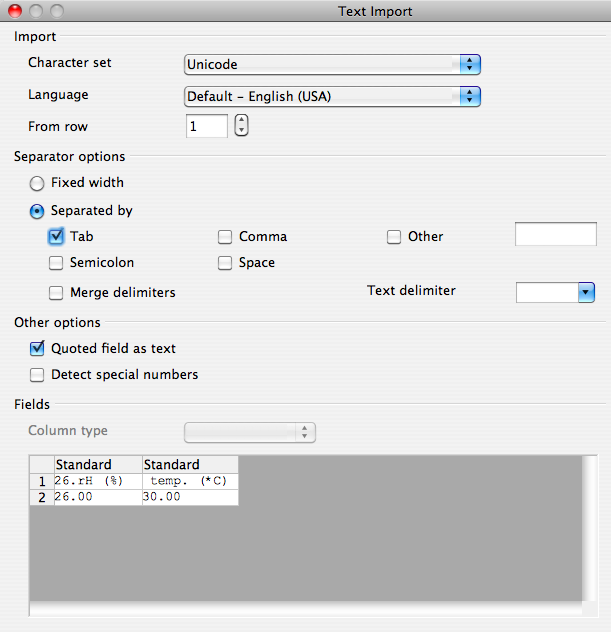 The sketch is outputting tab-separated data, and prints out column headers at the beginning. Select the two columns of numbers, and click the graph icon. In the Graph dialog box, choose Line type, the Lines Only option, then click Finish. Your graph will be inserted in your spreadsheet. Voila, graphing made simple! If you have a serial terminal program like CoolTerm on your computer, you can also capture to a file. 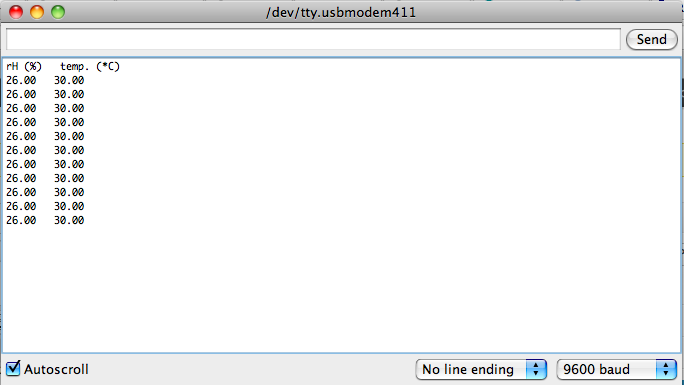 To do so, open CoolTerm, and choose your serial port in the Options menu. Click the Connect icon, then from the Connection Menu, choose Capture to TextFile… and Start. Give your file a name and save. Note: if you want the file to start from the beginning of your sketch, hold down the reset until you’ve started capture. 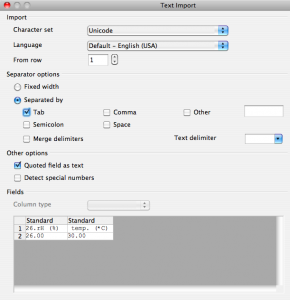 To stop capture, choose Connect > Capture to TextFile… > Stop. Then you can use your file in any application you want. Change the file extension to .csv and you can open it in a spreadsheet and graph as above. Sometimes you want to save data when you’re not connected to a personal computer. Attaching an SD card to an Arduino is fairly straightforward. There are several different shields that have SD cards on board, and the Arduino Ethernet has an SD card right on the main board. The SD card library makes it simple to save files to your SD card. Format a microSD card as FAT16 or FAT32 on your personal computer, and load it onto your Arduino. Then upload the SDCardDataLogger sketch. This sketch reads the sensor using the Adafuit DHT library, and if there is an SD card present and initialized, it saves the results to a file called “DATALOG.CSV”. Transfer this file to your computer and use it as you wish. You can open it in a spreadsheet and graph it as you did above, or anything else you wish. 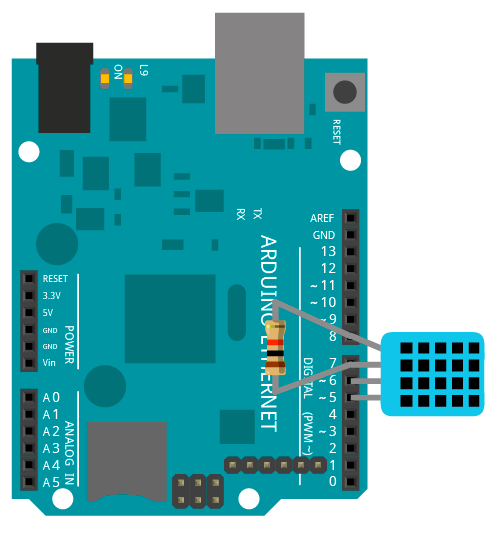 If your Arduino is connected to the internet via Ethernet, you can connect to pachube.com and program it to post data there. Then you can use Pachube’s data storage and graphing tools to save and visualize your data. Write down the feed number and fill it into the feed variable in the sketch (PachubeDataLogger). You’ll also need your API key, which is a long string that identifies you to pachube.com. Click My Keys from the pachube menu to get your key. Copy it into the apiKey variable in the sketch below. When you look at your feed, you’ll see a graph of your temperature and humidity. Now you’ve got several methods to log data from an Arduino. You can change the sensor to any sensor you wish, and revise the sketches shown here to read that sensor instead of the DHT11. Enjoy! I’ve added code to the repository for this tutorial that shows how to use the Pachube code with a BMP085 barometric pressure sensor. Thanks to Adafruit for the excellent library for this sensor. I’ve also added an example showing how to use the BMP085 with the SD card, and with a Realtime Clock. Again, Adafruit’s library for the RTC makes this easy. Pachube became xively.com, and then they became part of the Google IoT Cloud platform, so I can’t vouch for the validity of any of the pachube examples on this page now. They may work, if xively/Google didn’t change the API. This entry was posted in arduino/wiring, circuits, code, electronics, Pachube. Bookmark the permalink.